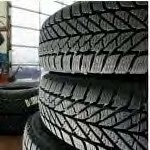 Article ~ Tires: Do You Know The Manufacture Date? How safe are your tires? Tires deteriorate over time, even if they are not used or driven on. The tires may appear to be in like-new condition on the outside, but inside the rubber is slowly deteriorating. This may dangerously weaken the tire and increase the risk of a blowout at high speed or during hot weather. You can figure out how old your tires are by determining the manufacture date. Date will most likely be on the outside rubber wall of the tire but may be found on the inside wall of the tire. Dates stamped on tires manufactured after the year 2000 are usually four digits long. This number is stamped within a recessed roundish rectangle on the sidewall of the tire. The first two numbers indicate the week of the year the tire was manufactured; the second two numbers tell the year. Therefore, if the number found on the sidewall is 3505, then the tire was manufacture in the 35th week (around mid-August) of 2005. Tire retailers should NOT sell tires that have been in storage for more than six years after the manufacture date.